Brooklyn-based quintet Pavo Pavo have a keen ear for oddly attractive pop music. The group are made up of friends Eliza Bagg (violin, synthesisers, vocals), Oliver Hill (guitars, synthesisers, vocals), Nolan Green (guitars, vocals), Austin Vaughn (drums) and Ian Romer (bass). Slouching in a comfortable up-cycled chair alongside the rest of Bella Union’s artsy roster, the skinny and finely moustached Nerdsters are in many ways your typical big city indie-types, almost nonchalant in their intellect and ultra-liberal in their creative pursuits. It comes as no surprise then that the band consider themselves proud studio urchins and a close-knit group of buddies who you’re more likely to find behind the mixing desk than dancing to a club mix. 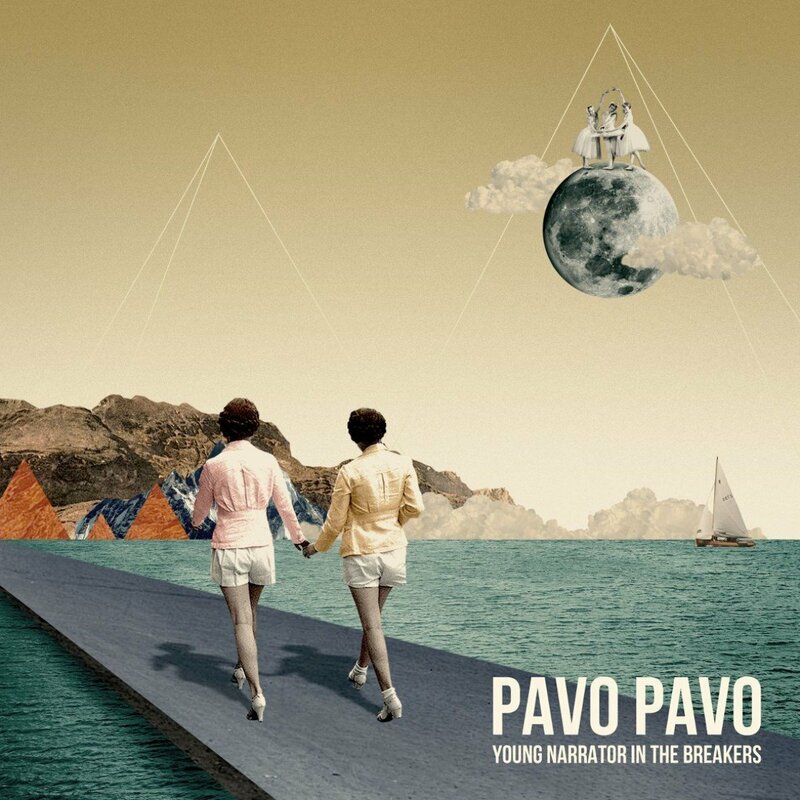 The strange traits of these reclusive creatures are detectable in the abstract, slow-burning nature of Pavo Pavo’s debut album Young Narrator in the Breakers. It’s a record that coaxes you into a sleepy retro dream-world, where the 70s never ended and the future already happened. Young Narrator… uses a plethora of sounds that niggle the brains synapses into motion, whilst massaging the memory banks in equal measure. In opening track ‘Ran Ran Run’, guitars creak like floorboards and smooth minimal synthesisers jab back and forth through the space-time continuum. ‘Wiserway’ has a kind of romanticised retro quality that’s filmic in its beautiful simplicity. Harmonies slip in and out of consciousness throughout ‘Somewhere In Iowa’, hanging on the line of “Summer days/they’ll be back again someday”. In the wonderfully dreamy Annie Hall, basslines bumble along at their own pace, oblivious to the xylophones floating above. ‘Ruby (Let’s Buy The Bike)‘ sounds a bit like Django Django with twee levels cranked up a notch. The wobbly tremolo twangs of Grizzly Bear lurk about through Hill’s lead guitar and Bagg’s jarring keyboard changes that Brian Wilson would approve of. ‘No Mind’ sounds like something concocted in the psychedelically charged cranium of Tame Impala’s Kevin Parker, all ambient and funk-laden. ‘John (A Little Time)‘ is probably the finest example of the band’s wonky pop vision in full HD, bursting into joyous spirit from a slow, shadowy intro. 2020 ‘(We’ll Have Nothing Going On)‘ is a picturesque sign-off, where vocal harmonies ring like a Hawaiian lullaby into the not so distant future. Young Narrator In The Breakers is released through Bella Union on 11th November 2016.